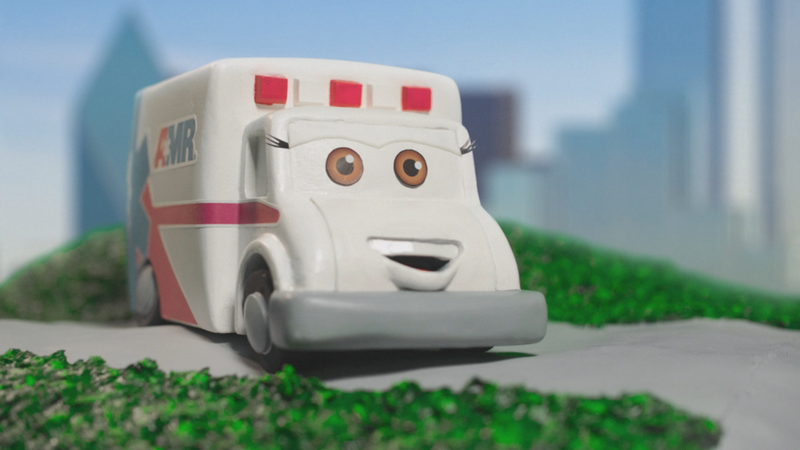 After directing the documentary Bricks in Motion, my friend Philip Heinrich started working for a healthcare company which, among other things, oversaw the ambulance company AMR. AMR wanted to release series of new public service announcements they could post on social media, focusing on basic safety issues like the dangers of overheating in locked cars. 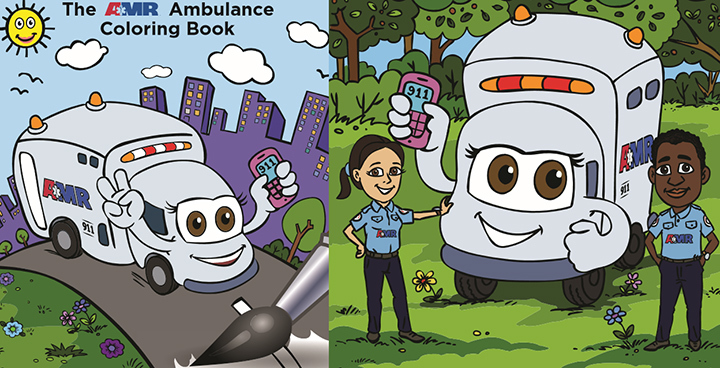 They wanted the shorts to feature their mascot, Amby the Ambulance. Philip successfully pitched using stop-motion to bring Amby to life, and asked if I would be interested in helping. I had never built a stop-motion puppet before, but I was eager to expand my skills, so I accepted. Philip sent me some reference of Amby from an AMR coloring book and list of basic requirements he needed the puppet to have. Amby would narrate the PSA shorts, and so she needed and articulated mouth. He also wanted her wheels to flex and move so she could tilt her body as she talked. 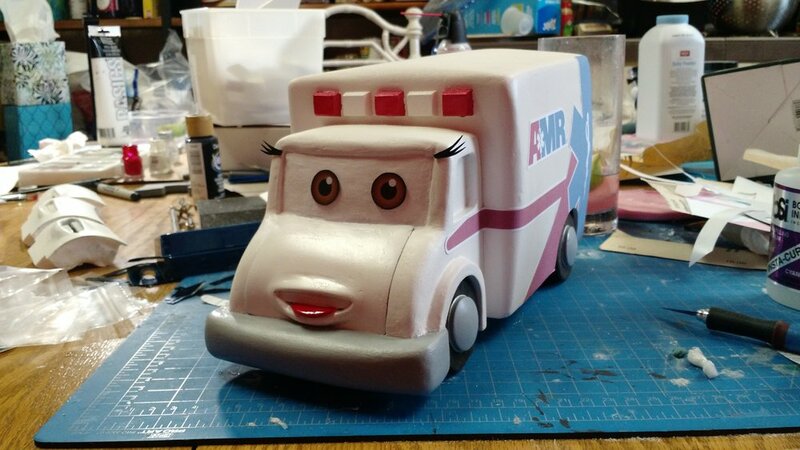 We worked with AMR's team and were able to settle on a design that, while still cartoony, looked more like a real ambulance. 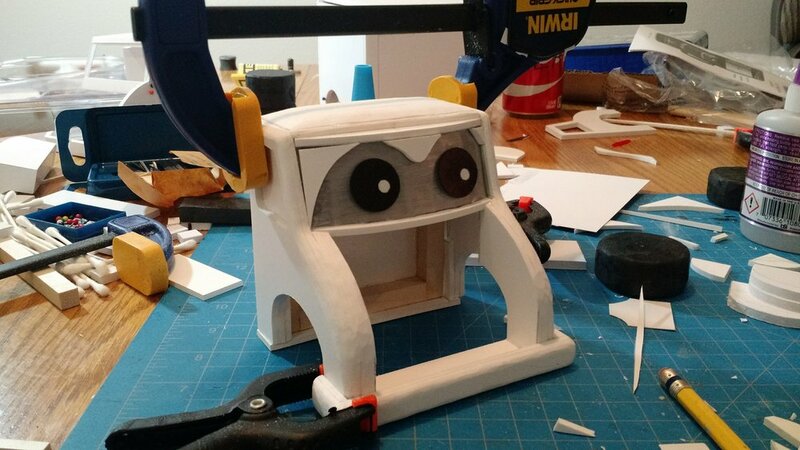 I began with a 1:1 mock-up made from foamcore to dial in the proportions of the puppet. Philip approved of the general shape, but wanted a rounder, more "bubbly" shape, so I moved on to Palight PVC foam sheets. I glued sheets together where needed and cut and carved the PVC with very sharp X-acto blades and a dremel with a drum sander. 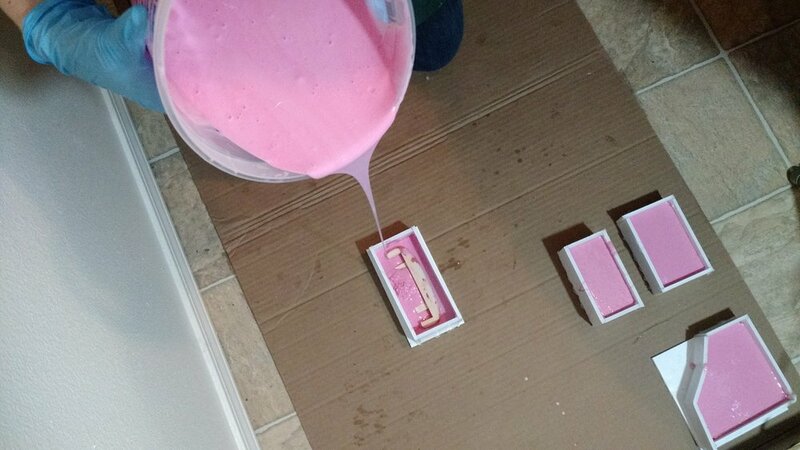 Occasionally I would use Bondo car body filler to help fill voids or mistakes. After a few weeknights of working on and off on the cab, Philip and I were satisfied with the shape. The entire front "hood" area of the cab was left open - this is where the replaceable mouth shapes would be inserted. Once the shape of the cab was approved by the folks at AMR, I disassembled the cab into its component parts and sought out the help of my sister, Bethany. She had some experience with making molds, and she spearheaded the process of making containers for the parts, preparing and pouring the silicon rubber, and making sure the molds set properly. Clay was carefully pressed around the bottom of the pieces to prevent silicon leaking underneath the pieces, and temporary containers were glued around the pieces with hot glue. She used Mold Max 30, and mixed just enough by weight to fill all of the molds at once. Tapping the molds released the air bubbles, and we let the molds set for a day. Once the molds were set, we removed the original pieces made from PVC foam, wood, and dried Bondo filler, and filled the silicon molds with Urethane resin (Smooth-Cast 305 from Smooth-On). Once the resin had cured, I removed them from the molds and assembled the cab from the new resin pieces. Because the body of Amby was relatively large, empty and simple in design, I decided to not cast it to save on resin and to reduce the weight of the puppet. Instead, I just built the actual body out of the PVC sheets and balsa wood, held together with super glue and Gorilla glue. Eventually I would sand over the gaps with Bondo body filler and paint the whole body with spray paint. Amby didn't need an interior so I was able to keep the body lighter than the cab. While I worked on the body, Bethany made 12 copies of the hood piece and sculpted 12 different mouth shapes. This was a long, laborious process, and I am very grateful to Bethany for doing it! She had the sculpting skills to pull it off, and I was super happy with the look. She made the initial hood pieces out of CX5 clay, a special type of modeling clay that becomes soft and malleable when heated up (even soft enough to pour into a mold), but hardens when cool and can be carved like wood, or even molded further with a hot tool. With the clay, she was able to add more clay to the hood pieces (for the lips and tongue), and remove clay (for the mouth cavity), until she had 12 unique mouth shapes. These shapes were then cased in resin using the same method as the cab pieces. With everything cast, it was time for final assembly. The cab was glued to the body, and a simple wooden frame was created for the wheels. At this point the project was overdue, so I had to rush with the wheels. They are made from EVA foam and wooden dowels and jointed with parts from a small gorilla tripod. The joints were not the strongest and Amby tended to sag under her own weight, but they worked well enough for Philip. I would certainly do them over if I had the chance now. With everything glued in place and all the rough edges sanded, Amby was primed with paint and given a quick paint job. Magnetic paint was used on her windshield, which allowed her magnetic eyes to stick and allowed for easy repositioning. Simple stickers with the AMR logo were printed for the body, and tiny eyelashes made from thin vinyl were added last minute. Ultimately, Philip was happy with the puppet and was able to get five episodes out of it before the project was shut down and AMR was sold by the company that Philip worked for. Making Amby was a huge learning experience for me, and if I were to make her over again, I would do almost everything completely differently. I also learned a valuable lesson about having a proper workspace when taking on projects like these. I mostly built Amby on my kitchen table, and I also moved into a new house halfway through the process! When I completed Amby, I was thoroughly happy to be done with her. Now that time has passed, I can say I'm happy with the final product, and glad I did it.